The OCRA Checklist is one of the tools of the OCRA method for assessing risk associated with repetitive movements of the upper limbs. Task rotation is when a worker alternates between two or more tasks during a certain period of time (i.e. : a day, a month, a year). The multitask analysis process by the OCRA Checklist involves the following steps: 1 - Determine the full task rotation period: daily up to yearly; 2 - Identify repetitive tasks performed in the period; 3 - Use the OCRA checklist to calculate the “intrinsic” score for each task as if it was performed for the entire period; 4 - Analyse tasks and scores with respect to real time exposure and apply two alternative computational models: Time-Weighted Average and Multitask Complex. While, in the industrial sectors, tasks rotate often in a similar way every day and consequently the previous procedures could be easily applied, in some productive sectors exposure assessment is much more complex being characterized by the presence of several tasks over periods longer than a day (weekly, monthly, yearly). 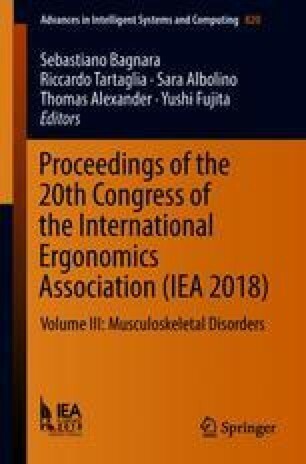 In general the study of these conditions are based on the use of the Checklist OCRA and on adaptations of the two multitask analysis models.